Kunzite is a pink to lilac colored gemstone, a variety of spodumene with the color coming from minor to trace amounts of manganese. It is a member of the Silicates family. 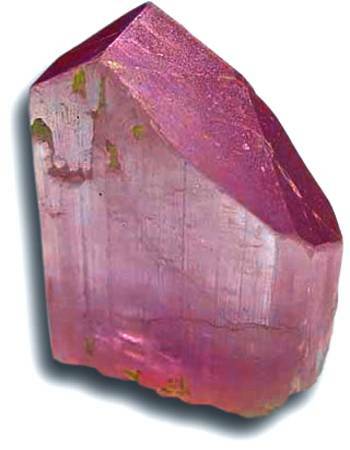 It is the pink to light purple gem variety of the mineral Spodumene. Kunzite was discovered in 1902 and was named after George Frederick Kunz, Tiffany & Co’s chief jeweler at the time, and a noted mineralogist. It has been found in Brazil, Canada, CIS, Mexico, Sweden, Western Australia, Afghanistan, and Pakistan. Kunzite is a composite of lithium, aluminum, and silicate, which naturally forms in large sizes. Its gem-quality stones are naturally transparent and tend to be eye clean, meaning the stone is free of inclusions to the naked eye. 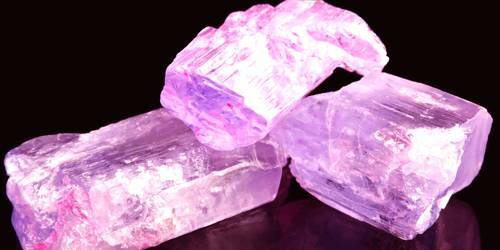 Kunzite has a lovely pink color and is becoming increasingly popular in the gemstone market. One notable example of kunzite used in jewelry is in the Russian Palmette tiara and necklace worn by the Duchess of Gloucester. It occurs in nature as a result of the process of irradiation or heat treatment of transparent specimens. It comes in beautiful gemmy crystalline form, with color ranging from green to pink. This mineral is often from Afghanistan. Kunzite is a relatively recent gemstone, having been first discovered in the 20th century. It was first found in the pegmatites of Pala, California, in 1902, and is named after the famous mineralogist George F. Kunz who first identified it. Though it wasn’t until the 1990’s that this gemstone became a more mainstream gemstone, having been used only as a collectors gemstone prior to that time. Kunzite deposits are quite extensive and yield large amounts of this gemstone, thus making it very affordable. Extremely large and flawless crystals of Kunzite have been found, and these can yield very large and flawless faceted gemstones.